Dos noches de alojamiento en un hotel de 3, 4 o 5 estrellas en Zimbabwe incluido. The 5 star Victoria Falls Hotel was fantastic. Loved watching the monkeys skurrying across the lawn. Flights on BA good. Excursions we could have arranged after arriving for following days and added more after we arrived. If only there 1 day, then pre-arranging w/b necessary. But there is so much to do, 3 days or more would be best. Lodging and arrangements were very good for experienced travelers. The details of the activities were weak - fortunately the lodge, restaurant and Victoria Falls itself was wonderful. Guides were poor and clarity on offerings made fuzzy. A good service that could be much better coordinated. This was an excellent trip and the Victoria Falls Safari Lodge is a must stay with its private watering hole out in the bush and the Booma Drum BBQ dinner it is a great experience. We also enjoyed the feeding of the vultures at 1:00pm each day. The food and service was excellent at the hotel. 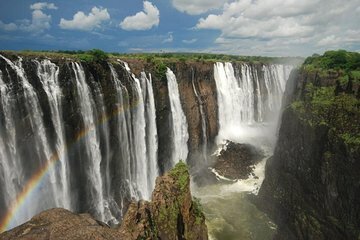 Our guides through the falls and on our Zambezi River cruise were very knowledgeable and helpful. From the minute we boarded the plane to Victoria Falls we had no worries. Wild Horizons' drivers and guides were prompt and informative. Our group has memories to last a lifetime, and we would not hesitate to recommend it. The A'Zambezie River Lodge was great. Beautiful setting, very nice room, and good breakfast. I was disappointed in the Rainforest tour of Victoria Falls. Our guide Stanley seemed to be in a great hurry. There were 8 people in our group and he kept going off and leaving us on the walk around the falls. All of us were frustrated and started waiting for each other and just letting him go. Also I wish the tour had included a walk along the Zimbabwe side. We walked across the bridge ourselves, but by the time we did that and got through all the peddlers, there wasn't time to walk down the path. This trip was amazing and perfect for me as a single traveller. Organised tours but not stuck being with a group, perfect! the Wild Horizons team were there on time every time and everything worked like clockwork. i stayed in the 4 star hotel option at the safar lodge... OMG i had no idea it was going to be so amazing. and im so glad i didnt waste money on 5 star as this hotel is every bit a 5 star location along with 5 star staff. if you want to do more than the tour activites then you need another day and night. i didnt have time for the rafting, bungee or the boma bbq dinner. so i left wishing i could stay longer... and will come back one day in the winter to see the falls in full glory. I had a great time. The resort was beautiful, I stayed at the A'Zambezi River Lodge. 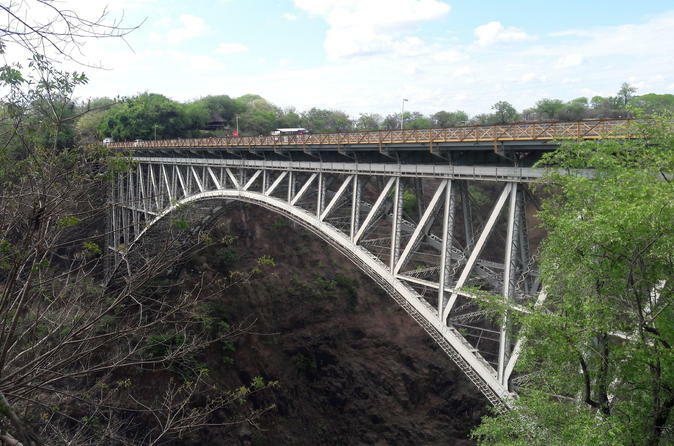 It was located right on the Zambezi River. They evening buffet is worth they price! The cruise was pleasant. I went during high season so we didn't see as much as we possible could have seen:-( We did see hippos. I was able to take great footage of them. Victoria Falls is AMAZING. You will get wet but raincoats were provided. I elected to participate in additional activities. 3 nights were not enough. I could have used at least one more day. There are many adventure activities to do there. One additional activity that I did, was the elephant walk. Afterwards they brought out a cheetah. (Raised domestically, couldn't go back into the wild). We were able to take pictures and pet him. He even licked my wrist/arm without thinking I am breakfast!!! I had an awesome time. I would definitely go back!!!! Due to no fault of Viator, we missed our flight and were devistated. The fast and efficiant support we received from the ground staff was 100. They condenced our visit into a fantastic fun packed 24hours and we enjoyed every minute of it. Thanks.